When I saw the first videos of security teams unleashing attack dogs on the peaceful defenders of their sacred tribal lands and water supplies, and of the circumstances surrounding that action, my immediate thought was: My God! It’s the 1970’s all over again! 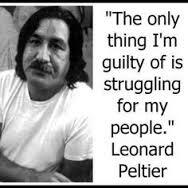 In particular I was thinking of the persistent violence on South Dakota’s Pine Ridge Reservation that led to a confrontation with federal agents and to the arrest and conviction of Leonard Peltier, who four decades later continues to languish in a federal prison—for allegedly killing two FBI agents who, as the preponderance of evidence would seem to show, were themselves the true aggressors. The case for that position is eloquently contextualized, laid out, and thoroughly documented in Peter Matthiessen’s literary testament In the Spirit of Crazy Horse; the trial transcripts themselves constitute more than ample proof of what a kangaroo court that was! And of how little the actual presentation of fact really matters when prosecutors and judge (and/or jury, we mustn’t forget) unite to impose an outrageous but pre-determined end. I was thinking, too, of Buffy Sainte-Marie’s most political songs, from “Now that the Buffalo’s Gone” (1964) through “Bury My Heart at Wounded Knee” (1992) to the present decade (see May 2015 blog essay). 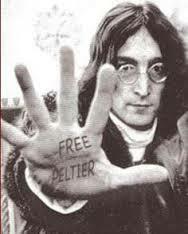 In the latter she gives a shout-out, first, to Peltier: the FBI is caught lying in court, yet “still Peltier goes off to jail”(followed by the exclamation: “bullets don’t match the gun!”); and, second, to “her girlfriend” Anna Mae Aquash, whose brutal murder in the same time frame and vicinity might have had something to do (the lyrics suggest) with her activism denouncing the illegal dumping of uranium near Native communities. And now, as brute force is met by thousands of nonviolent protesters, the National Guard is called up to help state and local enforcers in an absurdly militarized response to a Constitutionally-protected act of nonviolent resistance; Native Americans rounded up en masse, brutalized and subjected to strip searches whose only conceivable purpose is to humiliate and intimidate; journalists detained and charged, for their reporting, with the ridiculously trumped-up charges of rioting and other nonsense. Stephanie Woodard reports in the October 2016 issue of In These Times—poignantly and at great length—that Native Americans are dying at the hands of police at an even higher rate than African Americans or Latinos. So it is only fitting that the epicenter of this growing exercise in mass civil disobedience should also be Ground Zero in the newly minted Native Lives Matter movement. And the same desperately vital issues are at play here as have been noted in other contexts: police violence and militarization; a racialized criminal justice system; and climate denial and environmental degradation, among other things. So in that spirit I offer up the following humble piece of literary rhetoric, a story told in the form of a traditional origins tale and plucked from my unpublished 1980’s-era collection of a novella and four stories called Saint Mary of Magdalene. As to the story’s artistic merits or demerits, I can only say with assurance that it is at least a good deal better than previous drafts—and delivered as a genuine expression of solidarity. This they tell, and whether it happened so or not I do not know; but if you think about it, you can see that it is true. … and when they arose in the morning, behold, they were all dead corpses. There were three worlds before this one but they were all bad. The Creative Power was displeased with the people who lived in them. He destroyed the first by fire and the second by water. Then he sent a rainbow as a sign that there would be no drowning of that world, because he was pleased with it, but in the end he saw that it was not better. “This world is like the others,” he said to himself. “I will have to destroy it the same way that I destroyed the first.” He would have done it but the people found a way themselves and for once did not need any help. He just waited until it was time to build the new world, and then he tried once more to see if he would finally get it right. The end came at last because the people had made fire balls to fight their enemies with. 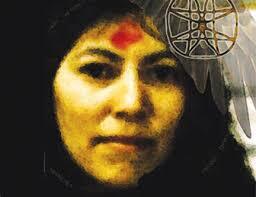 The magic fire of the Wasichu was not like any that the people of the visions had ever known. It could make the hair fall out of women’s heads and faces drop to the earth like rain. The Wasichu brought together elements of both earth and sky, of seen and unseen worlds, and bound them, then loosed them and filled the air and covered the ground with poison. They did not do this all at once. They would rise up in the metal birds they called airplanes and drop the fire balls on people who were hungry and poor and could only be made more afraid. Then the great leaders would make speeches and threats, and build bigger and bigger towers of weapons to see whose would be the tallest. They did not really plan to destroy the whole world but to keep control over what they had of it. These were the Wasichu, the terrible white people with hair all over who had overrun the holy Turtle Continent just before the end. They were the same ones who wherever they went bought up grass and trees and water and wind, who believed that they were wiser than the Creative Power, and everywhere destroyed the people who obeyed the true visions. The end came because they learned to make fire balls, and because they could not stop there. It came because of their hunger and thirst to own what was not given them to own. It came because they hated earth and sky and water and wind and all of the creatures that the Creative Power put in the world. The Wasichu hated cockroaches most of all and spent their last breath of life in a deadly fight to get them out of their houses and off of their land and their world. 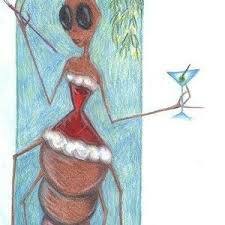 The cockroaches had come first of all the creeping creation, long before any people, and they had even survived from other worlds that were destroyed. They were stronger than people. They spread many times faster than rabbits. The people knew all of that and resented it and wanted to destroy them. The Wasichu most of all, because some people did not mind so much if the truth is told. The Wasichu had watched too many bad movies, like The Blob that Ate Chicago, and feared that the enemy would eat their world. They waged a war of extermination. Their first efforts did not work. The cockroaches were resistant to the poisons that were used, or their generations quickly built up resistances, and in no time there were more roaches than the people had ever seen. They were fighting a losing battle. Then one man had the idea to fight a dirty war inside of his own home. Iktome, the Spider Man, who came in many disguises to the ancient people, must have seduced the Wasichu in some new form because at almost the same time, throughout the whole world, other people began doing the same thing, each one without any knowledge of the other. The first man, the Wasichu warrior with hair that covered his head and face, took his family and camped with them in a faraway woods. He said to his woman: “Those filthy insects had better get out of there while they still can because this is their last chance. Any of them left tomorrow are going to die.” And in the morning he was inside of the house, covered from head to foot with a giant blackish bubble and a monstrous suit that made him look like a Wasichu demon from their darkest underworlds. Soon the fire bombs exploded and the poisons, for which our people have no names, followed the roaches into the tiniest cracks and crevices and then the man was gone. He did not come back with his family for a whole week. Before he brought them home he came with other men, and they cleared the house of dead roaches and destroyed unhatched eggs and purified the air for human life. But during the night, while the children slept in one room and the conquering warrior and his woman in the other, the surviving enemy emerged from their hiding places and began to grow several sizes. The same thing was occurring all over the world, and in the morning the people woke up dead, except for the warriors who stumbled out of their beds and died seconds later of heart attacks when they each bumped into a giant cockroach. The end came because they had to play with the magic fire that the Wasichu demons had taught them to make. For the roaches it was no great problem. In the morning they feasted on the men and were satisfied until later when they finished with the others and then wandered out into what was left of that third world. Fire-weed began to grow up out of the rubble of many houses, a sign of renascence, but the roaches still tracked the poison with them and finished destroying that world. They just waited then until the Creative Power was ready to build the new one. I hope to follow, soon, with other material: the complementary re-publication of a letter-to-the-editor, published in my local newspaper, on the subject of Colin Kaepernick and the Black Lives Matter movement; the announcement of a new anthology (with some of my newest fiction) of the Southern Indiana Writers; and, perhaps, some brief notes on the Joan Baez concert my son and I recently attended. This entry was posted in Uncategorized and tagged "Bury My Heart at Wounded Knee", "Now that the Buffalo's Gone", "The Fourth World", Anna Mae Aquash, Brett Alan Sanders, Buffy Sainte-Marie, Dakota Access Pipeline: resistance and repression, Iktome: Spider Man (trickster god), In the Spirit of Crazy Horse, Leonard Peltier, Native American protest music, Native Lives Matter, Peter Matthiessen, traditional origin tales: Native American. Bookmark the permalink. Thank you, Brett, for raising consciousness about this issue.